Tagged with South Korea, University of Aberdeen. Scotland’s University of Aberdeen is set to open its first overseas campus in South Korea, making it the first UK higher education institution to open a branch in the country. 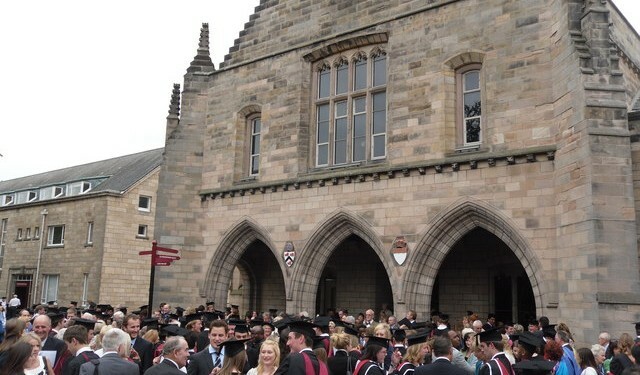 Graduates at the University of Aberdeen. Photo: Iain Lees. “The Korean partners actively support the establishment of the campus, which we look forward to becoming a centre of expertise in offshore engineering"
Backed by the South Korean government, the campus will open in 2016, based in the Gwangyang Bay Free Economic Zone in Hadong County in the south of the country. The campus will be primarily funded through a grant from the Korean central and local governments, with a “very minor initial investment” from Aberdeen itself, a university spokesperson told The PIE News. This includes an agreement that has been signed to secure ‘establishment funding’ from the Korean Ministry of Trade and Industry. The campus will specialise in teaching engineering subjects related to the offshore oil and gas industries, including an MBA in energy management and an MSc in subsea engineering and oil and gas topside engineering. The government backing comes as part of South Korea’s economic strategy to develop its offshore industry, and will enable the campus to become “a centre of expertise in offshore engineering”, said Hee Bong Lee, commissioner of the Gwangyang Bay Free Economic Zone Authority. The initial intake will be limited to 70 students across all Master’s and PhD programmes, rising to 145 when it reaches full capacity. The campus will also offer professional development (CPD) programmes, which will not have an upper enrolment limit. It will aim to recruit students from across the world, with a particular focus on South Korea and neighbouring East and South East Asian countries, where there is particular demand for postgraduate education for the offshore industry. “The new campus will export our world-class educational offering to a new market in East Asia, but it will also open up huge opportunities in research thanks to the impressive facilities located there,” Aberdeen’s vice principle, Seth Kunin, commented.